Join us, Volunteer, Have fun. Here at Norfolk Snowsports Club, we’re all nuts about skiing and snowboarding and we would like to share our enthusiasm with you! Our instructors and coaches, and many of the other people you will meet here, are all volunteers who give their time freely to share their expertise with you. GET INVOLVED – JOIN THE CLUB! Become a Norfolk Snowsports member and join the Club; there’s always something going on at the slope. Being a member allows you access to our brilliant facilities for Open Practice, all of our coaching sessions, the Club Bar and also discounts on our improver courses. Whether you’re a pro skier/boarder or a novice at snow sports, we welcome new members with open arms. We offer a range of membership packages and benefits. There are a wide range of ways you can take part in competitions for Norfolk Snowsports Club and a lot of our members do very well – some even having gone on to take part in the Winter Olympics!! The Freestyle Training we offer leads you to be able to compete in tournaments around the country and further afield, as well as our Home Grown Competition, The Farmer’s Jam, held annually. Our Race Team is very successful, especially in the Eastern Region (ERSA) Races. Coming along to the Wannabes session may start you on the pathway to success. The Club also runs inter-competitions such as our yearly Club Champs slalom racing in November, a Night Slalom in Spring and various “Jam Nights” for Freestylers with spot prizes and lots of fun! Become a Norfolk Snowsports volunteer and help add extra support to an already vibrant and welcoming team. For each hour you work, you earn an hour of Free-Time on the slopes, worth £7pp. This can be put towards Open Practice, coaching or training sessions and can be used by your partner and children also, so can be a fantastic way of keeping your family skiing while still helping out your Club. 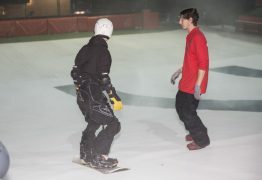 Our fantastic ski and snowboard instructors are all volunteers! 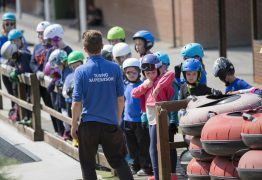 Whether it is introducing a newcomer to the basics of putting their boots on, helping someone advance through the levels and get to grips with snowplough or linking their C-turns or pushing people through their paces at race training, freestyle or moguls, then our instructors are an integral part of our Club. Each Spring we take applications for ski and snowboard trainees and following a selection process, those who are chosen do a year of schooling with the Club including regular Tuesday night training sessions, shadowing courses of lessons and then leading these courses under supervision. At the end of the year, after an assessment, the successful candidates gain their Level 1 Snowsport England Qualification and are then able to teach at the slopes. Fitting someone’s boots for their first lesson can be a very satisfying experience; you can sense their apprehension and see their nerves. To then put them at ease and see them again afterwards when they are beaming and have thoroughly enjoyed themselves, is very rewarding! All necessary training is given and slots for the boot room include regular fortnightly shifts or just ad-hoc sessions whenever you can help out. What better way is there to spend an evening or a few hours of the weekend than to join in with a tubing party! Our supervisors often become part of the group, laughing, joking and ensuring everybody has an enjoyable time! All training is given and shifts include Wed-Fri evenings as well as weekend days. You would not have to commit to regular slots if you do not wish to; just the odd shift here and then would be enough to keep the tubing running and get you earning some free time for yourself/your family. Our tubing comments book is very rewarding for our supervisors as our customers really are very thankful to have had such a great time and they like to show their gratitude by praising their supervisors in the written word. Working behind the Club bar allows you to socialise with members and non-members alike. Our customer ages range from 1-100 and all of them are very grateful to receive that thirst-quenching drink when they finish on the slopes or come in for their morning coffee! The Club can be very busy, especially at weekends and during events, so it is a great place to earn some free time and keep yourself busy. Shifts include weekday evenings from 6pm and weekends from 9am – late. 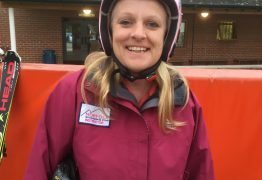 Working alongside those with disabilities is one of the most rewarding volunteer roles at Norfolk Snowsports Club. We have regular users of our Sunday Adaptive sessions as well as those that come along for a taster or pop in now and again when they have some spare time. All training is given and you do not need to be able to ski to help out; roles include “driving” the sit-ski, helping students access the Poma lift overall helping to build their confidence as well as their skill level. Adaptive sessions run from 2-5pm on alternate Sundays throughout the year.